Every paladin likes a 'lil gold. This mog is very Pally. I love using the gold plate pieces on my Paladin, but its hard to do it without looking like every other Paladin out there. I liked this set because the darker pieces added in seem to cut some of the brightness of the other pieces. By far the hardest part of this set to attain is the chest, if you're planning on farming may the light be with you. Shoulders- Lightbringer Pauldrons, Shoulderbraces, Shoulderguards The token for these shoulders are dropped by Mother Shahraz in Black Temple. If you're not into running old content you could pick up the PvP shoulders from Kezzik the Striker in Netherstorm for a whopping 750 honor points. Chest- Glorious Breastplate I absolutely dread farming, so I skipped it on this. I bought it off of the AH, depending on your server expect to see it for 5,000g - 30,000g. Its an extremely rare drop, from what I understand the best place to find it is in the AQ trash. Belt- Glorious Belt This is another hard one to get. Again, depending on your server I would expect to see this anywhere from 500g- 3,000g. If you broke the bank buying the chest piece Conqueror's Girdle is a nice substitution. Legs- I chose to use Conqueror's Legplates just to have a smidgen of modesty. This is a relatively easy piece to aquire. I've picked up a few while running old BC dungeons and leveling other characters. Boots- Bloodfist Legplates I love both of these pieces, and the many recolors. I'm pretty picky about the shape of both my boots and gloves. These sets are a lifesaver, each recolor has a few colors to them which make it easy to mix an match with completely different sets. Again, another easy to find BC green. Shield- Option 1 I had a bit of an issue picking a shield to go with this set. In the end I chose two, and just switched between them as I felt like it. 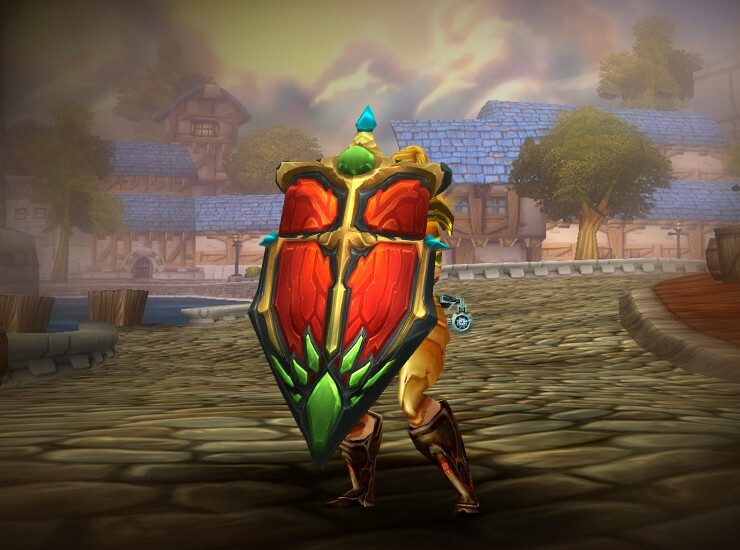 The shield to the right is Sword Breaker's Bulwark which drops off of Felmyst in Sunwell Plateau. I wouldn't reccommend soloing this raid instance, you'll need around 4 players, one of which should be a healer. 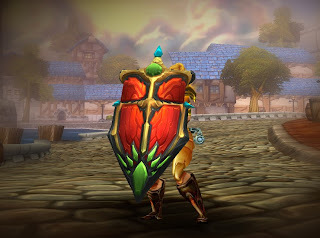 Shield- Option 2 I've seen this shield everywhere, it must be pretty common drop, though I have not had it drop for myself. You'll be able to find it under a few different names on you server's AH, and most likely 10g- 50g. Names to look for- Bayeaux Shield, Spell-Breaker Shield, Screaming Shield. Main Hand- Since I couldn't get my hands on Archon's Gavel I had to settle for plain over showy. My choice was the simple Dathrohan's Mace, obtainable through the quest The Dreadlord Balnazzor.